above that is Sri Gokula, known as Vrindaranya. what a joy to see that Holy Beauty! appearing like a sapphire Tamal. Srila Bhaktivinoda Thakur and Srila Krishnadas Kaviraj Goswami Prabhu composed these great things. 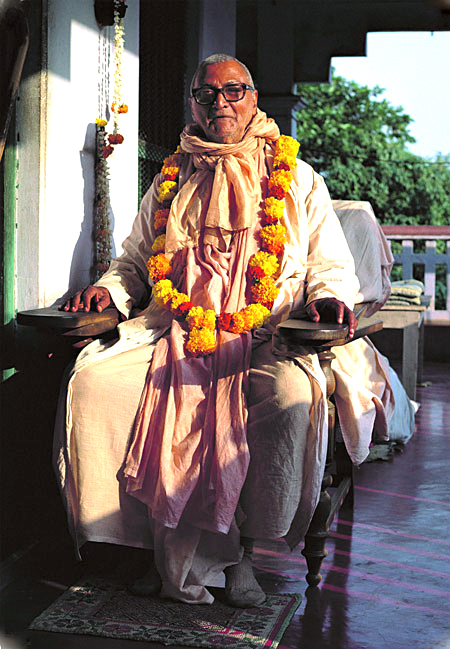 We are not actually in the practice of reading them constantly, but I have heard such things from Guru Maharaj. These matters are very elevated for us. But there is our goal, and She is actually our Guru, as our Divine Mistress. Her Form is being described here. Real Devotion to Krishna is very rarely attained. If you see that type of Devotion anywhere, purchase it with your hankering, your laulyam. Only your hankering can give you your share of that property. That is the only price for that, otherwise you cannot achieve it after even billions of lifetimes of merits. So hunger is necessary for that; and hunger will come if you make your stomach empty first. First take some purgative and cleanse yourself. Then gradually hunger will come. 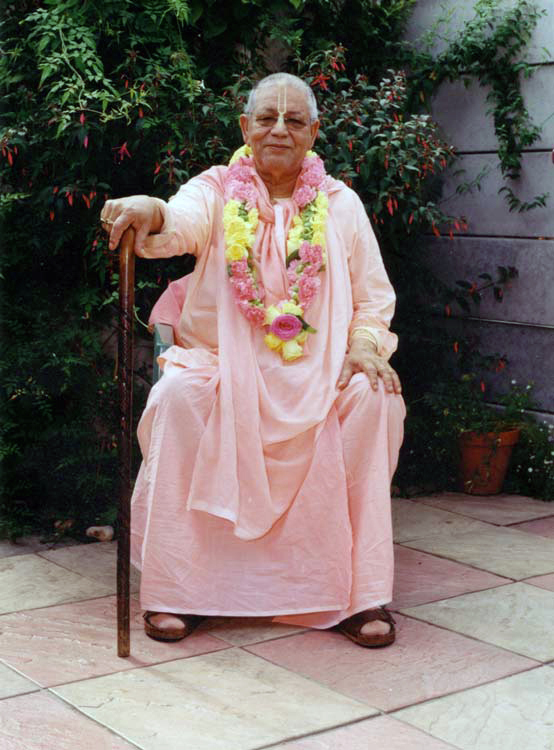 If Bhagavan says, “I like fried potato” and I give Him fried potato He will be satisfied. It is not necessary to think out what will satisfy Him if He tells us what He likes. So this is the directive of Bhagavan, the Supreme Lord. He is telling you what to do – do this, do that. This is Bhagavata-dharmma. If you take that path you have no fear from anywhere. Just run – whether your eyes are open are closed it doesn’t make any difference, you won’t fall down. We cannot guess from here how much joy and ecstasy is there, how much happiness and enjoyment. We are trying to guess but we can’t because our puppy brains can’t conceive it. What can we guess about that plane? It is living. The slightest idea of that Ecstasy you cannot guess with your puppy brain. What can you think? You can try to imagine how great the sky is, but how will you imagine it? In your estimation only two kilometres or two miles is great. But your brain can think “yes, the same sky is in America and in India” so some kind of broader conception is possible. Still even that is less than a mustard seed. ‘One mustard seed’ means fourteen worlds, up and down. All those planes together are called one brahmanda or universe, and that is like no more than a mustard seed in the presence of the Divinity. Then how much can you guess? If you can surpass the ideas of your entire consciousness then perhaps you can consider what kind of wonder that Ecstasy is. Our brains are always agitating this way and that trying to understand, but we cannot guess what kind of wonder that is, but it is. 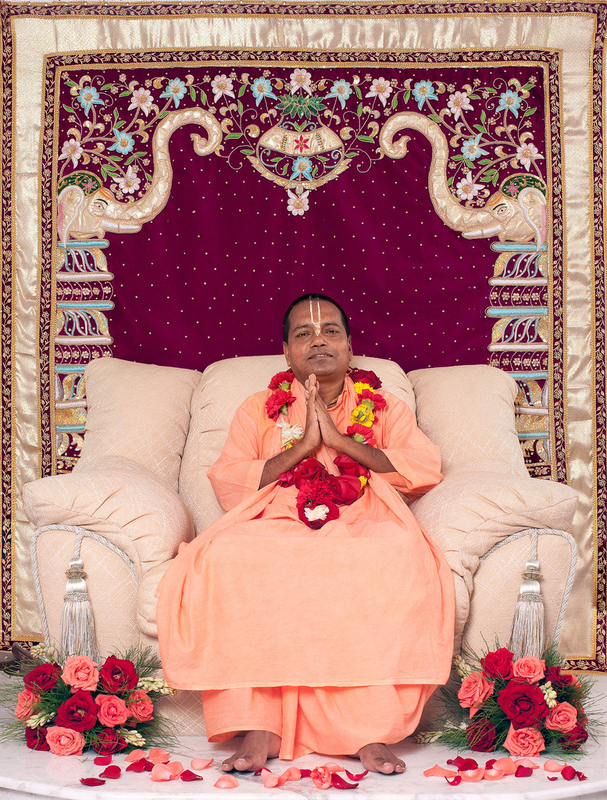 And the sages and seers – the munis and risis – they feel for us, and for our benefit they have compiled the Sastra to guide us; especially Srila Vedavyasa. So it is not helpful to try to understand this with our tiny brains. Only when that ecstasy will come and conquer our hearts can we feel it. And we must wait for that, not try for it. This is the way to taste it. When He will come my heart will be fulfilled within a second. That is the ecstasy, the essence given in the perfect philosophy of Vedanta. If you want that ecstasy you can try to worship that plane. Then you will get it by the mercy of the real associates of Krishna. And that is the main thing. But there’s no need to be hopeless; much hope is here, especially in this Kali yuga. Mahaprabhu said harer nama harer nama harer namaiva kevalam – chant the Hare Krishna Mahamantra without offence and you will get everything.